It’s still fresh in my memory… the white, airy and light cakes that my sister used to send me many years back. I did not know then (rather I didn’t bother to find out) that it was an angel cake. Later when I got hooked to baking, I always wanted to bake chiffon cakes and angel cakes. But couldn’t for want of a tube pan. Finally this Christmas Gaia brought me a 10 inch Wilton tube pan. 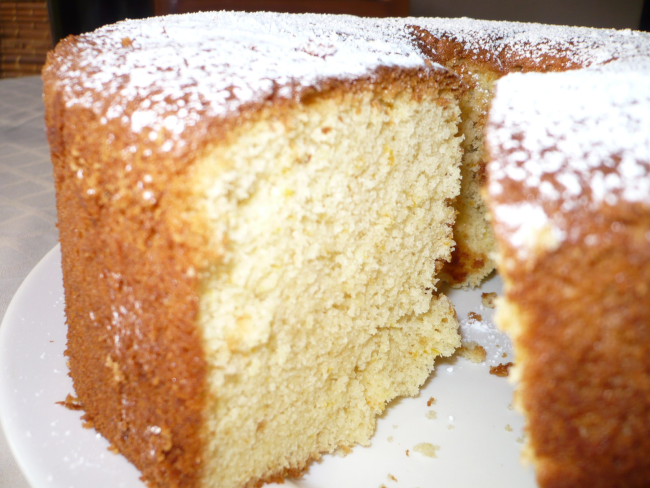 Though I wanted to make a chiffon cake before she went back, couldn’t manage it as we were very busy with other plans. So I was waiting for a chance to use the pan. 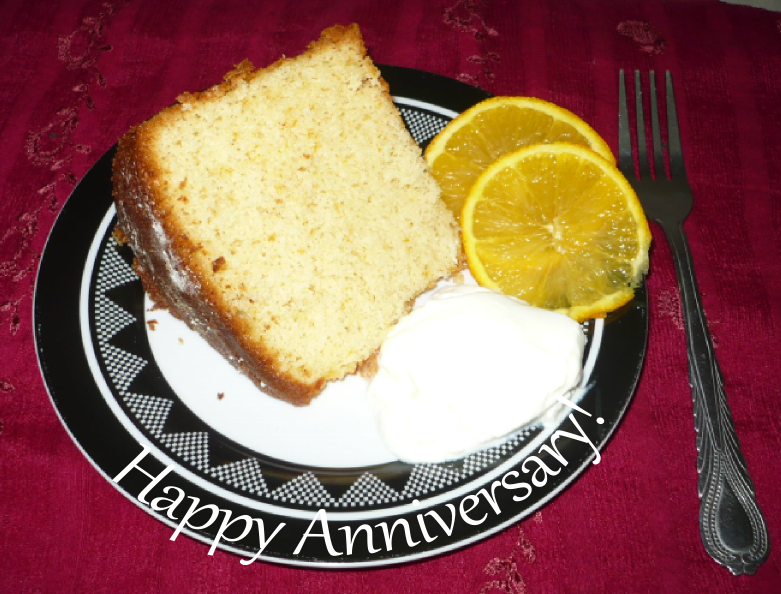 And when our wedding anniversary came around on the 2nd of Feb, it was the perfect occasion to make an orange chiffon cake. Moreover the fact that my husband neither likes iced cakes nor chocolate cakes is all the more reason to bake an orange chiffon cake. Chiffon cakes are very light and airy and made with lots of eggs, oil, sugar, flour and baking powder with any additional ingredient to flavour the cake like orange, lemon or chocolate, as per your preference. The use of oil instead of butter makes the cake really moist and keeps the cake soft even after a few days in the refrigerator. 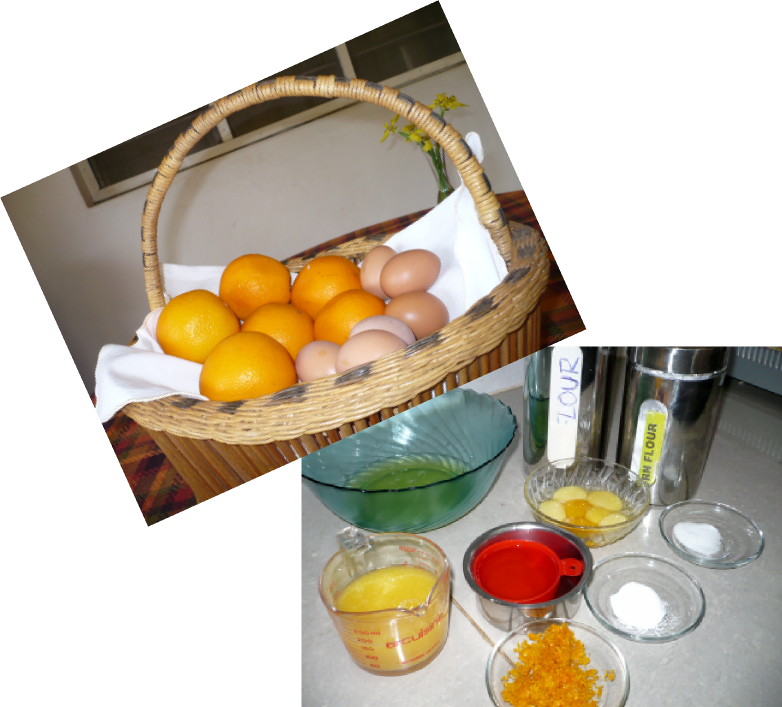 I used both freshly squeezed orange juice and orange zest to achieve the fresh orange flavour in the cake. Chiffon cakes attain their fluffy texture through stiffly beaten egg whites folded into the cake batter just prior to baking. A few points to bear in mind whenever egg whites are beaten to stiff peaks… Separate the eggs into whites and yolks as soon as they are taken from the fridge. Beat them after they reach room temperature using a handheld electric beater. Start with slow speed and change to medium when it still in liquid form. Beat for 3-4 minutes to get soft peaks. Add superfine sugar, a little at a time, and beat till stiff peaks are formed. Add the beaten egg whites into the batter by the cutting and folding method in 3-4 batches. If you don’t have superfine sugar at home just run regular sugar through the food processor for a couple of minutes before using in the recipe. Once the batter is ready pour it into an ungreased tube pan. Ungreased pans are used in chiffon and angel cakes because the stiffly beaten egg whites need to cling to the pan to rise. Once the cake is done invert the pan and let it rest in that position for a minimum of 1 hour. If you allow it to cool without inverting the pan, the cake collapses resulting in a lumpy mass. Once the cake is completely cooled, run a knife around the sides of the pan to free the outer section off the cake. Then run the knife around the tube and the bottom as well to get the cake released from the pan. Now leave it on a wire rack for further cooling. Preheat the oven to 165 degree celsius. Separate the eggs into yolks and whites and leave them aside to reach room temperature. Sift all the dry ingredients except sugar together twice. Mix 250 grams of superfine sugar with the sifted flour. Beat the egg yolks with vanilla essence. Make a well in the flour sugar mixture, and add the beaten egg yolks and other wet ingredients except egg whites. Mix together. Beat egg whites till soft peaks are formed, add the remaining 50 grams of sugar little by little and beat at medium speed till stiff peaks are formed. Cut and fold the beaten egg whites in three or four batches into the batter. Pour the batter into an ungreased tube pan and bake in a preheated oven for 45 – 50 minutes. Invert the pan for one hour once it is removed from the oven. Once it’s cold remove the cake from the pan. Finally dust the cake with some icing sugar and serve with whipped cream or fruit couli. Please let me know how it turns out when you try.